The French do things differently. I first heard Triangle loudspeakers at the 1981 Festival du Son, in Paris. That was, of course, after I had obtained admission to the show, in a nonintuitive process in which members of the press obtained their credentials at a booth inside the show. But my experience of the Triangle speaker, a small, three-way floorstander, was positive: It sounded clean and uncolored, and nothing like the BBC-inspired speakers I preferred at that time. The Triangle wasn't as neutral as the English norm, but there was something appealing about its soundsomething that, I later learned, Stereophile's founder, J. Gordon Holt, referred to as jump factor. Triangle has since become one of France's top three hi-fi manufacturers, and Stereophile has reviewed several Triangle loudspeakers over the years. Sam Tellig has long been a fan of the company's designs; Paul Messenger reviewed Triangle's Magellan Concerto in March 2005; and Art Dudley favorably reviewed the Esprit Comete Ex bookshelf model in April 2008. "The Esprit Comete Ex is a fine thing," he concluded, "a much better and more musical loudspeaker than one usually finds at this price and size, or from such a mainstream company." But I had never lived with a pair of Triangle speakers. It was high time I did, so I agreed to review the second model from the top of Triangle's new Signature line, the Delta ($8000/pair). The Signature Delta. . .
. . . is an attractive tower standing 4' tall. Set into the top of the enclosure is a bullet-shaped, gloss-black module containing the TZ2550 tweeter, which operates above 2.7kHz. This is the same titanium-dome unit, acoustically loaded with a die-cast aluminum horn, that's used in Triangle's top Magellan line. It sits immediately above a large-diameter, treated-paper-cone midrange unit that covers almost a decade, from 280Hz to 2.7kHz, and is constructed on a 7.3" aluminum frame. The midrange's cone is terminated with a narrow, pleated, short-travel surround. Although it has a dustcap, this is profiled to resemble a phase plug. The twin 7.3" woofers are mounted above and below a large, flared port halved by a horizontal divider. Each woofer has a fiberglass cone fitted with an aluminum dustcap and terminated with an inverted half-roll rubber suspension. The motor uses two ferrite magnets and a double-layered voice-coil. All four drive-units are manufactured in-house. Electrical connection is via two pairs of binding posts mounted on an inset copper-alloy panel on the cabinet's rear, and all the internal cabling is by Kimber Kable. The handsome enclosure is formed from seven layers of high-density fiberboard, each 3mm thick; the sidewalls are gently curved, and the top of the cabinet is beveled at an angle of 5°. The front baffle is barely wider than the midrange unit and woofers, to optimize horizontal dispersion, and the cabinet is raised a couple of inches from the floor by a black plinth. This plinth is 5" wider than the cabinet, but cut away at the front to allow an inverted conical foot to connect the enclosure to the floor. My review samples were finished in a beautiful mahogany veneer, brought to a high gloss with 10 coats of lacquer. Black frame grilles are supplied, but the speaker looks stunning without them: a combination of high technology and seductive-looking furniture. 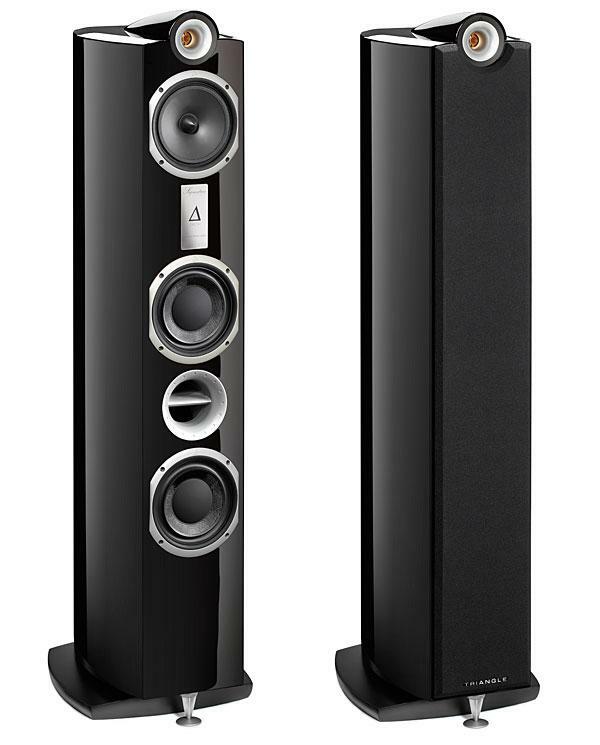 With so many speakers these days manufactured in the Far East, I noted Triangle's statement that "the Signature range is made entirely in Soissons [France]." I listened to the Signature Deltas without their grilles, and the speakers toed in to the listening position. However, when I sat in my usual chair, my ears were 10" below the tweeter axis, so I tilted up the backs of the speakers with pairs of original Tiptoes, which aimed the tweeters at my ears. After some experimentation, the Deltas ended up in almost the same spots as the Joseph Audio Perspectives, which I'd reviewed in July: the woofers were 34" from the LP cabinets and bookcases that form the sidewalls, and the front baffles were 86" from the wall behind them. Dual-mono pink noise sounded hollow if I stood up, but had an even balance, with no obvious coloration, when my ears were on or below the tweeter axis. The central image was quite narrow and well defined, although slightly more presence-region energy was audible from the right-channel speaker (serial no.333) than from the left (no.334). Listening with a stethoscope to the enclosure's walls as I rapped them with a knuckle, I could hear some low-level liveliness in the upper midrange, but also a slightly metallic, ringing overtone. Listening again with the stethoscope while I played the half-stepspaced toneburst track from my Editor's Choice (CD, Stereophile STPH016-2), the cabinet seemed to be most excited between 400Hz and 1kHz, but to be fair, this was at a low level. Back at the listening chair, the lower-frequency tonebursts spoke very cleanly for a ported design, though the region below 64Hz seemed a little reticent. The low-frequency, 1/3-octave warble tones on Editor's Choice were reproduced with full weight down to the 50Hz band, with the 32Hz band given some help by the lowest-frequency mode in my room. The 40, 25, and 20Hz bands were less audible. Even so, a pipe-organ recording I recently made in Oregon, with the Ayre Acoustics QA-9 USB analog-to-digital converter, of Jonas Nordwall playing the famous Toccata from Widor's Organ Symphony 6 in Portland's First United Methodist Church (24-bit/88.2kHz AIFF file), had tremendous weight through the Deltas when the bass pedals descended to 32Hz and below, yet without boom or blurring. The Signature Delta's low frequencies had excellent pace and force. Despite the sonic damage done to the low frequencies by the Dolby Digital encodingwhy lossy compression should degrade the lows, I have no ideaPino Palladino's driving bass guitar in "Every Day I Have the Blues," from the John Mayer Trio's Where the Light Is: John Mayer Live in Los Angeles (16/48 ALAC ripped from DVD-V, Sony 722727), reproduced by the Deltas, got me up from the listening chair to do the "humpty dance," as Wes Phillips once described me doing. Palladino's bass lines in this track, of course, were aided by the drumming of the incomparable Steve Jordan.